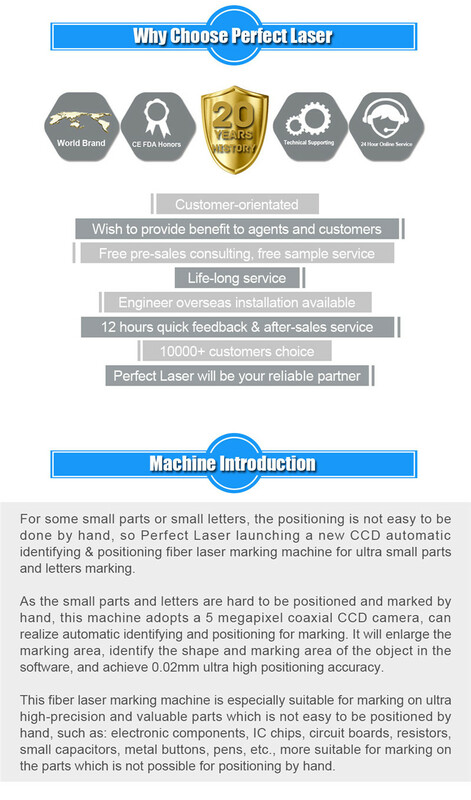 For some small parts or small letters, the positioning is not easy to be done by hand, so Perfect Laser launching a new CCD automatic positioning fiber laser metal engraving marking machine. It adopts a 5 megapixel coaxial CCD camera, can realize automatic positioning, it can enlarge the marking area and achieve 0.02mm ultra high positioning accuracy. 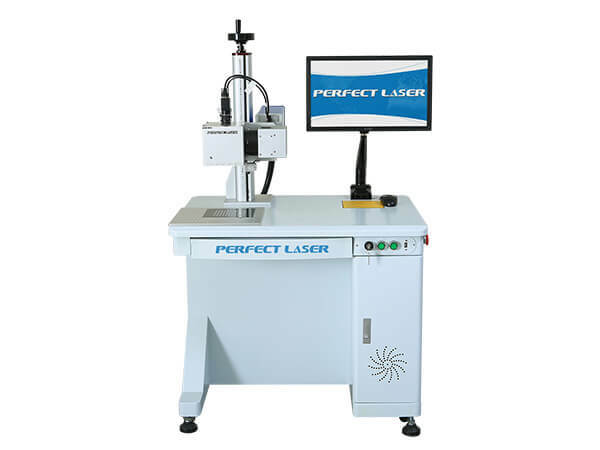 This industrial laser marking machine is especially suitable for marking on ultra high-precision valuable parts which is not easy to be positioned by hand, such as: electronic components, IC chips, circuit boards, resistors, small capacitors, metal buttons, pens, etc., more suitable for marking on the parts which is not possible for positioning by hand. 1. Automatically CCD positioning and identifying. With new developed CCD visual system, the objects can be marked on the appointed area in any position as long as the objects are within the scope of the laser scanner. 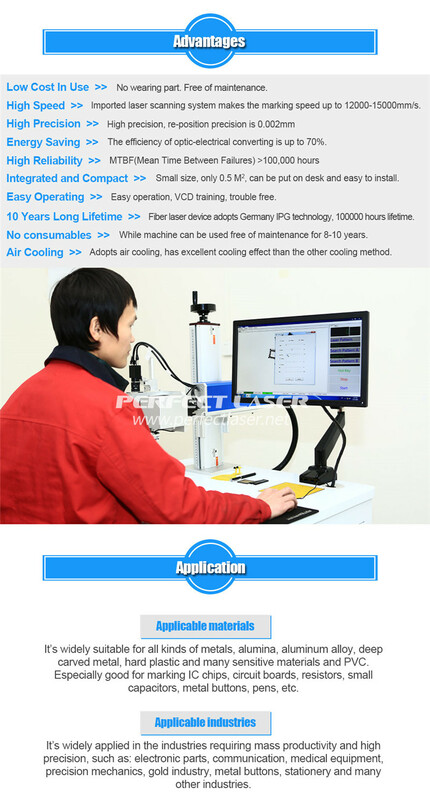 It greatly increase the productivity and simplify the process of production. Usually the fiber laser metal engraving marking machine can work with conveyor belt for production lines which has high requirement for speed and precision. 2. CCD camera with 5-megapixel. High resolution, and clearly capture the feature points in real time. 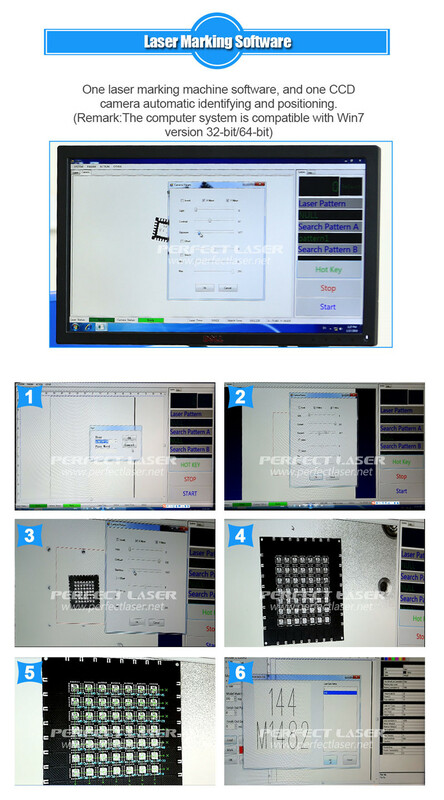 Any shape can be identified, and marking area of the industrial laser marking machine is controlled by software. Clearly track marking process in computer. This process is especially suitable for small tiny products. 3. Beautiful appearance, compact structure. Rotary system is optional item. 4. The fiber laser metal engraving marking machine’s working format is 110mm×110mm, which can meet the size requirements of most precision devices. 5. No consumables and wearing parts. 6. CCD camera software supports win7 32-bit and 64-bit computer systems. 7. 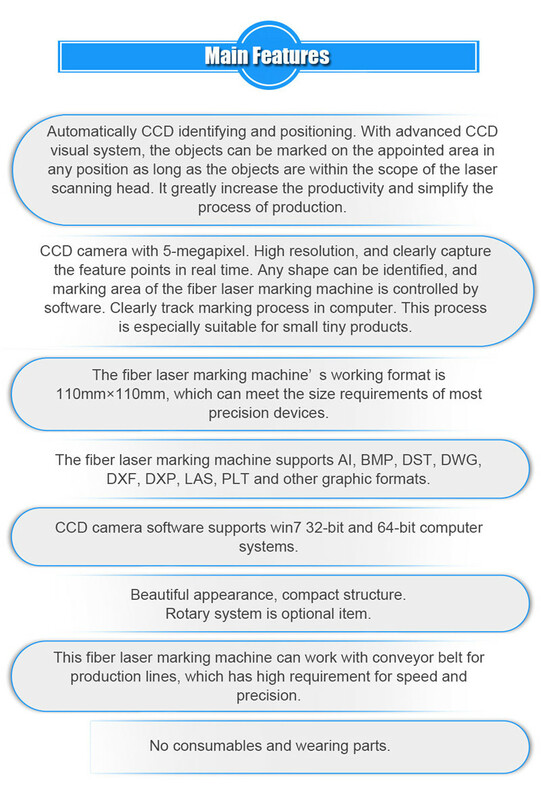 The industrial laser marking machine supports AI, BMP, DST, DWG, DXF, DXP, LAS, PLT and other graphic formats. 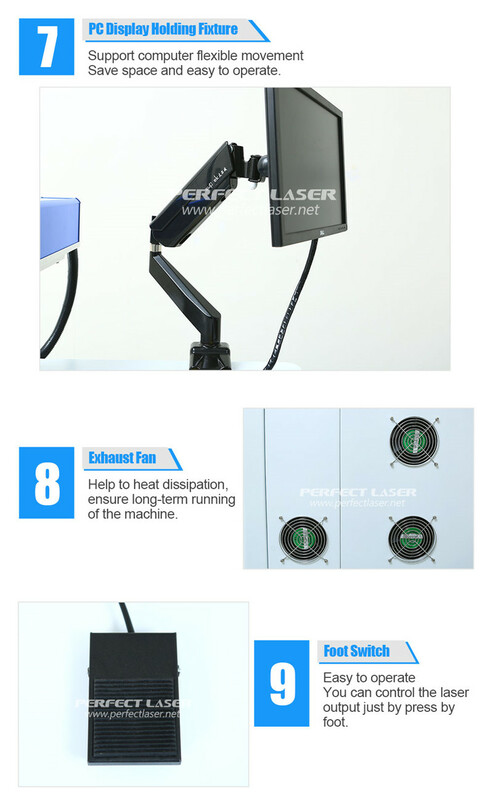 1.Applicable materials: this china fiber laser marking machine is widely suitable for all kinds of metals, alumina, aluminum alloy, deep carved metal, hard plastic and many sensitive materials and PVC. For marking on IC chips, circuit boards, resistors, small capacitors, metal buttons, pens, etc. 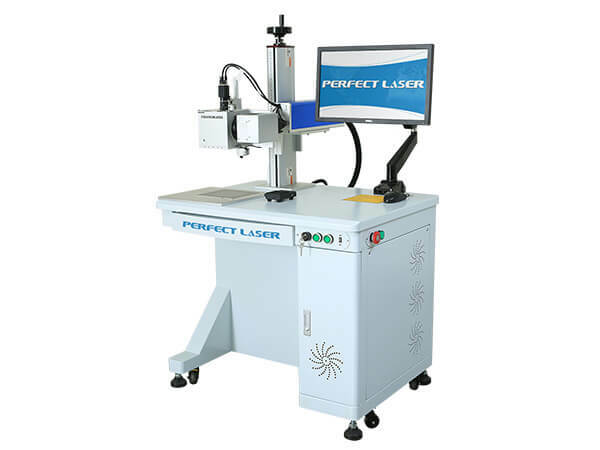 2.Applicable industries: the china fiber laser marking machine is widely applied in the industries requiring mass productivity and high precision, such as: electronic parts, communication, medical equipment, precision mechanics, gold industry, metal buttons, stationery and many other industries.